Several monuments in Yaxchilán (Stelae 11 and 16 and Lintels 9, 33 and 50) show the rulers Shield Jaguar or Bird Jaguar IV holding an unusual staff. This staff is made from wood with four sides and cloth attached to it. The staff is called the flapstaff. The flagstaff contains quatrefoil symbols. A quatrefoil looks like the picture on the left and is a symbol of the opening of the cosmic central axis at the crossroads of the four directions; it is the passageway between the celestial and underworld realms. The shape of the quatrefoil is similar to that of the glyph for the sun. The rulers with the flapstaff all wear an extremely similar costume, and is unique to the holding of the flapstaff. 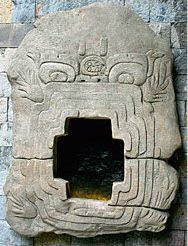 The most completely depiction of these costumes, on Lintel 9, shows the king as an impersonator of GI as the sun. His headdress depicts two aspects of GI, perhaps these two aspects are the rising and setting sun, or the sun at its northernmost and southernmost positions on the horizon. Stela 11 illustrating both Itzamnaaj B'alam II ("Shield Jaguar") and Bird Jaguar IV participating in a flapstaff event. The person on the right holds the long flapstaff. Calendric, architectural, glyphic, and ethnographic evidence shows that the flagstaff monuments at Yaxchilán refer to a ritual that was celebrated within a few days of the summer solstice. Several building in Yaxchilán are oriented toward the summer solstice sunrise. At structure 41 the sun’s first rays make a semi-quatrefoil of light on the floor as they pass through the stepped shape of the doorway on summer solstice. The entire Main Plaza is oriented from northwest to southeast. Several small buildings stand perpendicular to this axis, and they face southeast, the same direction as the plaza. Bisecting this major axis is a strong axis in the form of the stairway to Structure 33, and the group of monuments in the center of the Main Plaza. All these face northeast. The other monumental stairway at the site, that to Structure 41, faces the same direction, as do many temples along the first terrace of the plaza. The designers of Yaxchilán deliberately did build their temples on the broad, flat riverbank along the present Main Plaza or along the airstrip. They opted for the summits of the hills, from which they could observe the course of the sun, planets, and stars along the horizon and along the ecliptic. The fact that they chose this particular group of hills indicates that the view from those hills must have been important. The view of the sun rising between the two hills was such an important facet in the selection of the site for monumental architecture that they perhaps named their city after it: the Place of the Split Sky. On Stela 11 and Lintel 9 two individuals are shown exchanging the flapstaff. On Stela 11, Shield Jaguar performs his last recorded ceremony by passing the flapstaff to Bird Jaguar IV on summer solstice. On Lintel 9, Bird Jaguar IV is recorded performing his second-to-last official act: he hands the flapstaff dressed as GI to Lord Great Skull, who wears a solar headdress, on summer solstice. In addition to ethnographic evidence, linguistic reconstruction of the verbal phrases provides a clue to the meaning of summer solstice rituals. The verbs on the summer solstice monuments are practically identical: aj kaw wa’ chan – “he open (or stopped) standing sun”. This phrase might refer to the swing of the sun, which lingers at its northernmost declination on the horizon for several days at summer solstice. This is one of the most obvious stations of the year, when the movement of the sun slows to a standstill. Many aspects of the flapstaff refer to summer solstice and the passage of ritual responsibility from an outgoing to an ingoing ruler. The dates fall on summer solstice and during times of transition between reigns. Headdress elements refer to GI as the sun and Chac Xib Chac as sacrificer. Even the quatrefoil shaped holes in the flapstaff refer to the solar architecture. The verb on each of the monuments may refer to a standing still of the sun. Two of the summer solstice scenes, Stelae 11 and 16, actually face the point on the horizon where the sun rises on summer solstice. Paradoxically, Lintels 33 and 50 face the winter solstice sunrise. Mounting evidence from epigraphers, ethnographers, and astronomers indicates that the Maya conceived the directions not as east, west, north, and south, but as the four solstitial sunrise and sunset points, plus zenith and nadir. The alignments of structures and spaces in Yaxchilán supports this. Yaxchilán, The Design of a Maya Ceremonial City by Carolyn Elaine Tate. Rewriting History at Yaxchilán: Inaugural Art of Bird Jaguar IV by Sandra Noble Bardsley - http://www.mesoweb.com/pari/publications/rt09/RewritingYaxchilán.pdf. The Meaning of the Maya Flapstaff Dance by Matthew G. Looper. Glyph Dwellers, December 2003. http://nas.ucdavis.edu/NALC/R17.pdf. Quatrefoil picture: http://www.nytimes.com/2006/05/16/science/16maya.html?_r=1. Courtesy of Michael Love and Julia Guernsey. Stela 11 drawing: made by Linda Schele from www.famsi.org. 'Fiery Pool: The Maya and the Mythic Sea,' an exhibit at the Peabody Essex Museum, Salem, Mass. The Dresden Codex is one of four remaining old books of the Mayas from the pre-Columbian period. Pages 51 until 58 contain an eclipse table; a method to calculate dates on which an eclipse could occur. Solar eclipses occur during a new moon, when the moon is between our planet earth and the sun; lunar eclipses occur during a full moon, when our planet earth is between the moon and the sun. Eclipses can only occur if the moon is near a node of its orbit on the ecliptic. The moon's orbit crosses the ecliptic twice and there is a good chance that an eclipse will occur at a full or new moon nearest this time. This will usually be six lunar months, 177 days, after the first eclipse. 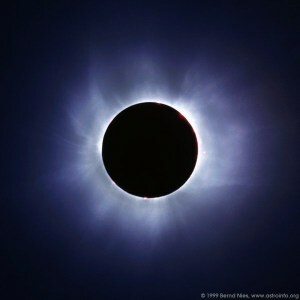 Several eclipses may follow at 177 day intervals, but the moon is further from the node at each repetition, and eventually strays too far from the node for an eclipse to occur. At the time of the last eclipse in a series, the closest new or full moon to the node may arrive after five lunar months, 148 days. 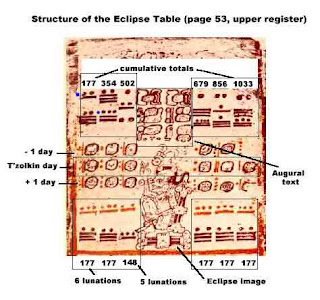 The most prominent of the eclipse pages in the Dresden Codex is a sequence of numbers: repeating 177 and sometimes 148. Above the sequence a cumulative total is recorded. Adding the number at the base of the column (177 or 148) to the total above, gives the total recorded number above the next column. Occasionally 178 is added to produce the total, even though the number at the bottom is 177. This appears to be intended to correct the cumulative count to take the rounding error inherent in the 177 and 148 day approximations into account: 6 lunar months = 177.18 days and 5 lunar months = 147.65 days. The base date in the Dresden Codex, to start from, is given on page 52a: the second column date in black: 9.16.4.10.8 12 Lamat. But here the problem arises: what is the corresponding date of our Gregorian calendar? 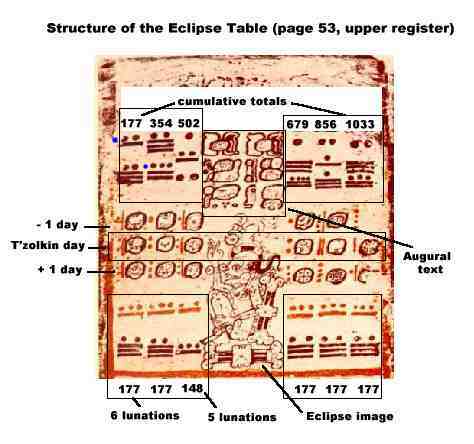 The Mayas were great astronomers and made remarkably accurate measurements, as you can see in the table below. So the solar eclipse dates need to very accurate too: they need to have occurred on the same date ± 12 hours for time differences. Currently the GMT correlation (584283) is the accepted method by Maya specialists to convert Maya Long Count days into Gregorian dates. But when using the GMT method, on only 8 of the 70 possible eclipse dates an eclipse actually occurred, within a timeframe of ± 12 hours (light green in table below). On 14 dates (± 12 hours) a new moon occurred,so this was a solar eclipse warning station (dark green). 48 times a solar eclipse or new moon did not occur on the date ± 12 hours (red in table below) (using the 584283 correlation method! the 584285 correlation is more wrong). If you count the warning stations, the hitrate of the GMT is only 31.43%! Luuk Buursen created an alternative correlation method and sent a document to a group of Maya specialists. He is still waiting for responses, but from two specialists he received negative answers. On 66 exact days a solar eclipse occurred (light green in the table below with a marge of ±12 hours), on 1 date a solar eclipse occurred 20 hours and 20 minutes later (red in the table below). On 3 dates a solar eclipse did not occur, but a new moon occurred, so this was a solar eclipse warning station (dark green). If you count the warning stations, the hit rate of Luuk's correlation is 98.57%, Luuk Buursen is only wrong on 1 date out of 70! The hit rate of the GMT ('83) correlation is 31.43%. The hit rate of Luuk Buursen's correlation is 98.57%. So, if you can choose between the GMT correlation (31.43% right) and Luuk Buursen's correlation (98.57% right), which one would you choose? Personal communication with Luuk Buursen. Een Opel die 1 op 160 km rijdt - al in 1970 ! !